We were thinking about stockpiling for Brexit in last week's Finance Fridays. This week we are looking at moving home. There are so many costs involved when buying and selling property that's it is always wise to see where you can save a bit of money. Buy new and do a deal – House builders have a lot of houses to sell on one go when they build a development. They will be keen to get rid of them so they can move onto their next project. Some will be willing to part-exchange your old house which could save on fees and commission. Some will also offer deals on deposits and stamp duty. 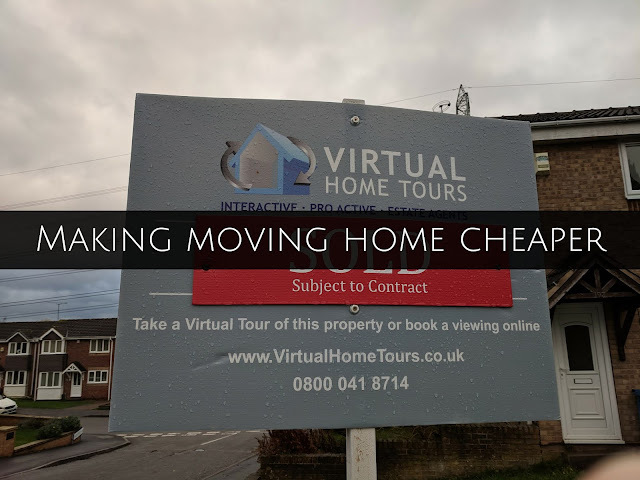 Alternatively you could opt to buy the show home and make an offer for all the fixtures, fittings and furniture or ask for them to be included in the sale price. Offer below the stamp duty threshold – Stamp duty can cost thousands and needs to be paid within 30 days of completion of the sale. In England if you are a first time buyer you can buy a residential property up to the value of £300,000 without having to pay Stamp Duty. If the property is over £300,000 you pay 5% on the portion between £300,001 and £500,000. So if a property is £325,000 it will cost you £1,250 in Stamp Duty. You could offer £300,000 and not pay any Stamp Duty at all and obviously less in mortgage costs over the whole term. Check solicitors' quotes – It's very easy to go with the local solicitors' firm to buy your home. There is no set fee or list of what should be included. Get several quotes make sure they include everything you need such as surveys and Land Registry fees. Do check if they charge extra for any calls you make to the solicitors' office – you could be charged for chasing them up! Also ask what happens if the sale falls through. Use a licensed conveyancer – You don't need to use an expensive solicitor to do the legal work for you. Often a licensed conveyancer can be cheaper. Since they specialise in property matters they can also be more knowledgeable. Become your own estate agent – It will be hard work but it could save you a lot of money. If you see properties locally selling quicker then this is the best time to do it yourself. Although people look online for homes for sale if they really want to get to know the area and see where the properties are they will drive around. Your board could caught their eye. Be aware though that you will need to deal with all viewings yourself and vet potential buyers. Have you moved home recently? Did you manage to save some money in the process? We were joined last week by Tea and Cake for the Soul who has been saving money through shopping around for car and home insurance. If you want to join in with this week's Finance Fridays then add your link to the linky below. Any post concerning financial matters is allowed. Full details here. It doesn't have to be published today as you have until 23.55 on Tuesday 4th December 2018 to join in.